* CSS Please are your friends! * points. Again, remember your vendor-specific prefixes for now! The really interesting bit is the keyframe code at the bottom. The translateX() value must be equal to the radius of the circle (i.e. the diameter divided by two). The rotate() functions in the from and to rules must be set to the start and end angles of the animation. Note that there are two rotate() calls — the second has to be the negative of the first. To understand why this works, let me walk you step by step behind the math which generates the frame where Saturn has rotated 45 degrees around the sun. From there we will show how this applies to the full animation. Next we need to move the object to the edge of the circle. For this example, let’s say the circle’s diameter is 300px. We set CSS3 transform property to transformX(150px) (150px being half of 300px). Step 3: Insert A rotate() Or Two Into The Mix. Et Voila! We are done. Pour yourself a martini — you deserve it! * Initialize the animation here. // Caches the jQuery object for performance reasons. // that the animation is repeated. * Vendor prefix code removed for sake of brevity. * Enterprise always faces the way it is travelling. Right after I wrote this article, I came across Smashing Magazine’s excellent article “The” Guide To CSS Animation: Principles and Examples by Tom Waterhouse. It has some other excellent examples involving advanced CSS3 Animations, combining the animation of two nested DOM objects to produce a bouncing ball effect. I am sure there are way more interesting techniques that can be done with them, and I will definitely the doing more research on CSS3 Animations in the future. If you have any more such articles to share below, I (and, I am sure, others who are reading this article) would love to hear from you. Animated GIF of the sun was taken from the The Solar & Heliospheric Observatory’s website. The photos of Jupiter and Saturn were taken from the Wikimedia Commons. Placing planets so close to the sun would cause them to burn. Do not try this at home. I must have been smoking something when I thought that a spaceship could be as big as a planet. Dammit Jim — I am a web developer, not an astrophysics major! Hey Zoltan, this is a great writeup! Readers who are new to CSS animations and transforms will be delighted to hear that Transforms are no different than other CSS properties in that they inherit from their parent element. This means a rudimentary solar system is trivial to create using all of the principles outlined in this blog post. Just nest your moon inside your planet, and nest the planet inside the sun, and so forth. I created a short intro to CSS 3D Transforms, and one of the examples is a simple solar system using the exact techniques described here. Check it out! 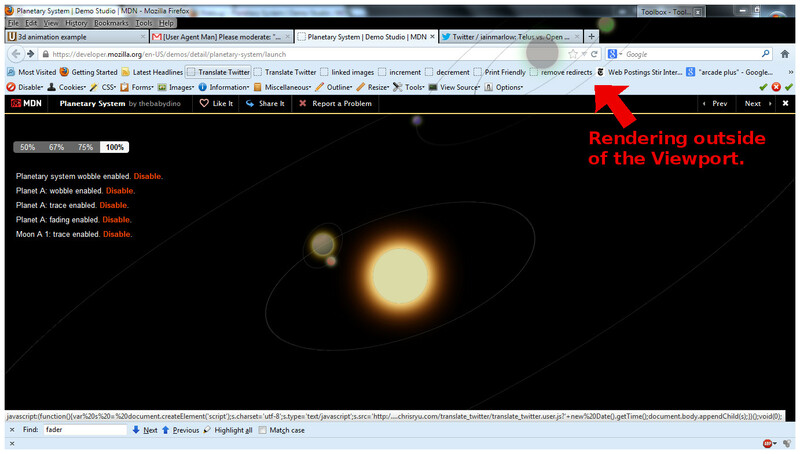 I actually did a planetary system using this method last summer. Also used skew to make the orbits look elliptical. And I also did a version with Jupiter and four of its moons (this made me want a bigger screen – I can’t even see it all, I was zooming out all the time while doing it). @Ana: Really great work! Do you have a write-up for your demos? I think the community would love to see how this was done in detail (there is quite a bit going on, and it would be interesting to have a walk-through the CSS in detail. One thing I thought was really interesting in your demos is what I believe is an unexpected but quite interesting bug in Firefox’s rendering engine. If you look at this screenshot, you can see that Firefox 19 is rendering some of your animations outside of the browser viewport and onto the browser’s chrome (where the top nav, location bar, etc are). Any idea how this is happening? Fascinating! No, not yet. I should start writing a few articles explaining transforms and some of my demos that are using them (the 2D and 3D shapes first of all, then other stuff, like this kind of circular motion & its derivatives, circular/ wavy menus, pie charts). I hope I’ll start doing that before this month is over. I have no idea what causes that in Firefox (and I cannot see it in Firefox 19.0.2 on Windows 7), but it looks really cool in that screenshot. @Ana: I hope you do! Please let me know when you write your first article. Looking forward to it! How to control speed of the moving object in the above example? The 4s is the speed of the animation in seconds. More information about the syntax used for CSS animations can be seen at the Keyframe Animation Syntax page on CSS Tricks. For the older-IE fallback, I do the same thing with jQuery’s animate() method using the duration property. It is set to the duration of the animation in milliseconds. More information is available at the method’s documentation page. I have given a lot of time since the last few months over the topic of animating an element along a circular path. Your article was a great help in laying down the foundations. But as I continued to give more and more time over the topic I found that I could improve the “algorithm” & the smoothness of the animation(targeted to 60 fps). 1) I started with you method, used a wrapper for the rotating element. Changed the transform-origin accordingly, rotated the main element & rotated the wrapper by an opposite angle. 2) My main aim was to rotate multiple elements. Suppose I had 6 elements – so I had to perform 12 animations. I thought I could improve on this. 3) In the next version I decided to move from CSS Animations to CSS Transitions. CSS transitions are more suited for this as circular motion is basically transition of an element from one state to another. Plus the no of lines of codes was reduced by a good amount. It is basically a jQuery plugin that presents a list of features as a circular animation. Features are placed along a circular path. When a user clicks on a feature, the feature is rotated along the circle and shown to the user along with the feature description. Initially when I was searching for circular animation on Google, I found only 2-3 relevant results. One of them was yours. Thanks a lot for this article ! Very very insterested and awesome, thnks for sharing !